My Twitter and blogging furrend @DashKitten was sent to the Rainbow Bridge by two killer dogs. He was a sweet, gentle soul, who lived to help others. Dash was my number one fan when I DJ. He never uttered a cross word to anybody that I know. He was a Super Hero, who had his own Super Hero outfit. Dash and Mom Marjorie (@Whskr) tried to help every anipal and their human, if one needed a forever home or was down on their luck. Dash, until we meet again, run free and say hello to the cats who came before me. The Bad Boys of Twitter and Pink Angels will be riding for Dash on the 24th, the last Tuesday of the month. 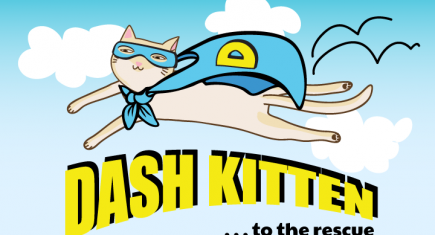 Please pay your respects to Dash Kitten and leave a message for Mom Marjorie. You can light a candle here. We were so stunned and so sad when we read the news about Dash. What a lovely tribute you have written for him. We still can't believe it. Dash will be missed by so many. We send lots of purrs to his mom. RIP, Dash...you left us far too soon. We're just heartbroken. Dash was an inspiration, and will be missed all around the world. Our hearts go out to sweet Marjorie. We have a special post ready to tomorrow for Dash. We're so sad about Dash. Such a sweet gentle soul who had such a violent end. RIP Dash. Such a sweet tribute. Dash will be missed by so many. We're just heartbroken for his poor mum. A very nice tribute. Like all, we were stunned by the news and our hearts go out to his mom. What a lovely tribute, we are very sad about Dash. I will never understand people who don't keep their dogs leashed. They should be arrested if you ask me. I'm still in shock over this news. You wrote a beautiful tribute to one of our dear buddies CK. Very well done. We are just heartbroken over Dash's sudden passing. Sending purrs and prayers to Mom Marjorie. Thanks for paying tribute to our fallen friend, CK. Dash was such a wonderful, caring, one-of-a-kind kitty. My human and I have been very upset over his death. My purrs go to his human, Marjorie. Well said, Keisha. Dash was one of the best, and we have lost a crusader, a hero, a rock and a good pal. The world is a sadder place without him. CK thank you, I am reading messages, post and tributes through a permanent haze of tears. Everone is so loving and kind to my beloved boy. We are stunned along with the rest of the posters here. Dash was kind and generous to all- it didn't matter if you were next door or halfway around the world. His heart was bigger than his body. We are honored that he considered us furiends. Our hearts goes out to his Mom Marjorie. It was such a shock when we read about Dash on Facebook. It was just plan horrible. Thank you for this lovely tribute for Dash. It is extremely sad about your friend Dash. We have visited his blog to leave our purrs for his family. Sweet tribute and beautiful graphic. I was so shocked to hear about this :( Poor Dash and Marjorie. They are both great anipals/people. We didn't know Dash but he certainly didn't deserve this mode of dispatch to the Rainbow Bridge. My condolences to his momma. I truly hope the killers received like dispatch and their owner got a hefty fine and jail time!